Springfield…. 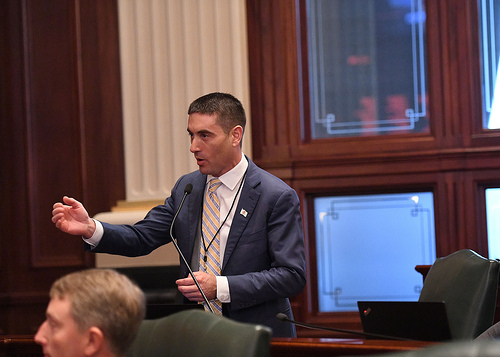 State Representative Mike Marron (R-Fithian) held a press conference at the Illinois State Capitol on Thursday to discuss his bipartisan resolution creating a Coal Ash Task Force. Representative Marron has filed House Joint Resolution 47 to create the Illinois Coal Ash Task Force. Marron says the task force’s goal will be to bring legislators, coal company representatives, environmental experts, and the public together to study the effects of coal ash on the Vermilion River and the rest of the state. The Middle Fork River merges with the Salt Fork River to form the Vermilion River, which flows through Danville, a city of 32,000. Danville is currently redeveloping its riverfront and intends to link this revitalized open space to the city’s adjacent downtown as a way of attracting tourists and boosting their local economy. Coal ash contaminants can include arsenic, barium, boron, chromium, iron, lead, manganese, molybdenum, nickel and sulfate, which are known to cause birth defects, cancer and neurological damage in humans and can harm and kill wildlife, especially fish. Marron says the membership of the task force would include two Senators and two Representatives selected by the legislative caucus Leaders, an IEPA representative, a representative of the Prairie Research Institute at the U of I, a representative from environmental groups, and a representative from the business community.